- When we order a profile bending machine, shall we indicate if it will be installed in horizontal or vertical position? No, all the section bending machines we produce (with exception for the model of Serie 3000 from 309 up to 315) can be installed both in horizontal and vertical position. - Is it possible to load a drawing directly in the CNC of the profile bending machine to produce the part? Yes, the CNC of our section bending machines has the possibility to import .dxf files. - Is it possible to bend all profiles with universal rolls supplied together with the profile bending machine? No, universal rolls are designed to bend the most common commercial profiles (like flat bars, square bars, angles etc..) but for some profiles (tubes and profiles with particular geometry) special rolls are required. - How do we order spare parts for our profile bending machine? You can find the proper form in the manual of the section bending machine. If you don’t find it, please send us an email indicating the machine serial number, the spare part code and possibly send us also a picture of the spare required. - Can we bend bigger sections than the ones indicated in the capacity chart of the profile bending machine? We recommend to work respecting the maximum capacity indicated in the capacity chart of the section bending machine and we will not take responsibility of damages caused by improper usage of the machine. Nevertheless is also possible, in some cases, to bend a bit bigger sections, especially if the bending radius is really big. -	Can we bend to bigger diameters than the ones indicated in the capacity chart of the profile bending machine? -	Can we bend to smaller diameters than the one indicated in the capacity chart of the profile bending machine? - To which material refers the capacity indicated in the capacity chart of the profile bending machine? - Is it always possible to bend the section to the minimum bending radius indicated in the capacity chart of the profile bending machine in a single passage or multiple passages can be required? Normally the minimum diameter indicated in the capacity chart of the section bending machine can be achieved in multiple passages. - During the bending process using a profile bending machine is the surface of the material damaged? Some scratches can appear on the surface of the material. In case of sensitive material the usage of special rolls is recommended. - Using a profile bending machine, is it possible to bend the full length of the profile? No, on all section bending machines, at both ends of the profile, a certain length remains straight. - What is the tolerance of the produced parts that can be achieved on your profile bending machines? We always guarantee the tolerance in the positioning of the movable parts of the section bending machine. We prefer not to refer to the tolerance on the final result because that is strongly affected by the material properties, on which we don’t have a direct control. - Is it always possible to bend smaller profiles than the ones indicated in the capacity chart of the profile bending machine? 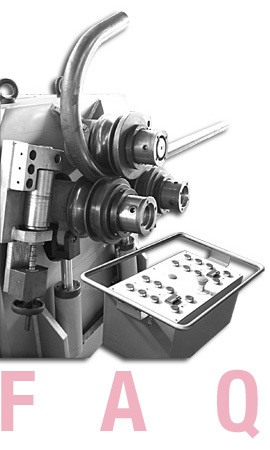 Theoretically yes, but for practical reasons the operating range of the section bending machine must not include profiles too small compared to the maximum capacity of the machine.